I recommend watching the video first. Simple, yet effective. It’s not live though, mind you. The tracks are still mixed and there are effects added to the instruments. But that’s definitely not a bad thing. Because the music is mixed, and adhering the rules of the VideoSong; the visuals are also mixed. The audio and visuals are more linked to each other than most other music videos. When a sound is played backwards, the same goes for the video that goes with it (the water glass at 0:34 in the video). When a single bass drum beat is repeated a few times in a row (1:25), the same goes for the video. This gives a very playful effect, as if someone is playing with parts of reality in order to make music (which is essentially true). 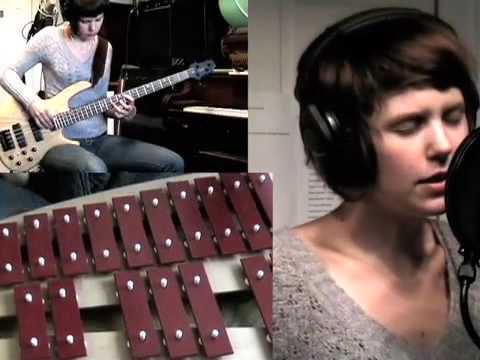 I’ve chosen Pas Encore to be the Track of the Week not because I think it’s the best song Pomplamoose have done, but because it’s the start of their collaboration on YouTube through VideoSongs. To see music being made in this way, in that little musical room, combined with their mutual chemistry, is something unique. If you like Pas Encore, I definitely recommend you check out their YouTube channel for more of these videos.